Guess what? Mommy Wanders Blog just turned a month old last week!!! Not a big deal (I know!) but as a simple celebration and my small way of thanking you, awesome guys, for supporting and keeping me inspired to write, I’ll give away another Photobook Philippines Voucher to one lucky reader! 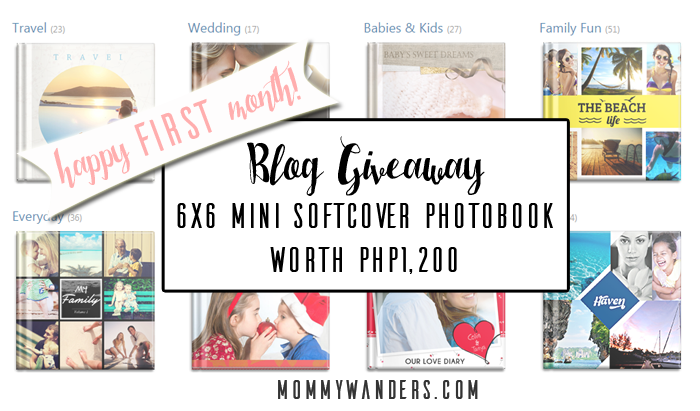 Just like my first giveaway, one of you will win a 6×6 Mini Square Softcover Photobook with 40 pages worth Php1,200.00 Voucher from Photobook Philippines. The contest will end on Wednesday, August 12, 2015. So you only have two days to complete the two easy entries below. Be sure to read the terms & conditions. UPDATE: Rafflecopter has randomly picked a winner. Drumroll please…..
CONGRATULATIONS TO CHANEL MARIE!!! 🙂 You will receive an email containing the voucher code which you can use until Saturday. 1. PHP1,200.00 worth of photobook, valid only for a 6″ x 6″ Mini Square Softcover Photobook, 40 pages. Voucher expires on 15 August 2015 and excludes shipping fee. Delivery within the Philippines. 5. Raffle ends on August 12, 2015 at 11:59pm. Announcement of winner will be posted as soon as the contest ends. Congratulations on your first month! Lovely giveaway! Congratulations to the winner and more power to you! Keep on blogging! congratz! nice giveaway! which reminds me to start my photobooks! Congratulations and more good writings to yoi! Ay hindi ako umabot! Haha! Hopefully, next time. 🙂 Hehe thank you! Congratulations! Good Luck to those who will join you giveaway. Congratulations on your first month + here's to more amazing months + years of blogging + writing. I love hosting and joining giveaways! Congratulations to the winner!